For the few days of Christmas break when our son attends day care, and we don’t have to report to school, my husband and I have been meeting at noon for the midday prayer service at our church. I always liked the noon, weekday mass–it’s quiet (no large crowd), it’s quick (no singing), and it’s intimate (no avoiding eye contact with the priest). It’s also a way to center the day around a few moments of mindfulness, to attend to the world and self without the distraction of work or social life. More often than not, I find that the gospel reading and quick sermon during these services speaks directly and pointedly to my current experience. The half hour I spend standing, kneeling, sitting serves as a lodestone that keeps a magnetic hold on my sense of purpose even as daily anxieties threaten to pull me out of orbit. Like many of my fellow citizens, though not enough of them, I’ve wrestled the last 36 hours with grief and shame about our country’s response to Tamir Rice’s death at the hands of police officer, Timonthy Loehmann. Yesterday, an Ohio grand jury decided not to indict Loehmann on criminal charges. The Rice family has expressed dismay, but not surprise, and have called for a federal investigation. My wrestling with the news ricocheted from deep sadness to self-righteous anger to helplessness to fear. Lots of Facebook posts. Lots of whispers and head shaking and shoulder shrugging at home. I met my husband on a downtown street before church service. He looked so handsome, so pensive as he headed toward my car in his wool coat and brown scarf, his hands thrust deeply into this pockets and a Book of Common Prayer tucked under his right arm, that I almost forgot to feel sad. We walked together into the chapel, passing two homeless people sheltering from the cold in the cathedral’s archways. Today, the priest reminded us, the church celebrates the Feast of the Holy Innocents. This liturgical day asks us to revisit the story of Herod and his ordered slaughter of Bethlehem’s baby boys under the age of two as he attempted to preempt the coming of a greater power than his own: God made man in the form of an infant Jesus. The magi unwittingly clued him in to the birth of Jesus, and feeling threatened, he made his gruesome decree. Joseph, Mary, and Jesus became refugees, fleeing the city for Egypt to protect their child. In the Catholic tradition, the prophecy that warns them to flee–a prophecy Joseph receives in a dream–is one of the Seven Sorrows of Mary, the hard knowledge that people wanted her child killed and that other innocent children would die at his expense. The priest started the service with these words: We remember today, O God, the slaughter of the holy innocents of Bethlehem by King Herod. Receive, we pray, into the arms of your mercy all innocent victims; and by your great might frustrate the designs of evil tyrants and establish your rule of justice, love, and peace; through Jesus Christ our Lord, who lives and reigns with you, in the unity of the Holy Spirit, one God, for ever and ever. Amen. It knocked the breath out of me. First, I thought–as I have been unable to stop thinking–about Tamir’s mother, Samaria Rice, and how she has every right to “refuse to be comforted” because her child “is no more.” How, at this point, every black mother has the right to refuse superficial comfort in a nation that erases her child everyday from its narrative of prosperity, opportunity, and safety. Second, I focused on that last line: your children shall come back to their own country. Would that it be so, I thought. Would that this country belong to all its children, and that the children whose lives we have stolen to protect our perceived power get to live, in some next life, in the country ours claims to be, a mature country that has atoned for its past, that does not have its hand on the trigger, a country that does not, as Fredrick Douglass predicted, “solemnly bind herself to be false to the future.” Would that we aim our efforts at making such a country. Such an effort, of course, would require us to hold our Herods responsible for their hubris and their fear, that we love our lowly citizens more than the greedy kings that reign inside our own psyches and in our streets and halls. It would require us to see each baby, in every Bethlehem, as holy and innocent children, as ambassadors to this new, better country, as our collective redeemers. 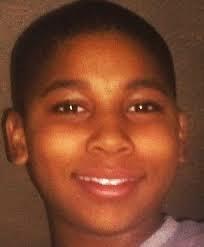 Receive, we pray, into the arms of your mercy Tamir Rice, and by your great might…establish your rule of justice, love, and peace. I too, have ached for Tamir’s mother, and all the other mothers who have had their children ripped from them, judged so severely for offenses or lack thereof, where a death penalty was never intended, appropriate, legal, or conscionable. But still permitted. I can’t understand the balance of fear between an armed policeman, and a child. Judges, juries, and many of the public take the policeman’s fear into account, but what of the child, teen, and adult of color who are perpetually fearful? My heart hurts. This is one of the most poignant, compelling, and insightful responses to the unfathomable tragedy that befell and continues to revisit the Rice family that I have encountered. Please submit your beautiful piece to publications that can share it with a wide audience. Thank you, Kersten. And thank you for taking the time to respond. You could help me out by sharing it on your own social media outlets! (non)seculargirl Create a free website or blog at WordPress.com.